Floor coverings specialist Carpetright has said it expects full-year profits to be at the "bottom end" of expectations amid a "volatile and unpredictable" consumer market. Its comments came as it said profits for the six months to 28 October sank to £0.3m from £4.1m last year. The chain blamed the lack of consumer confidence, increased competition and discounting for the fall. Carpetright shares ended almost 6% lower following the weaker outlook. A softening of the housing market in some areas, pressures on consumer spending from inflation and subdued wage growth have all fed into a weaker performance. 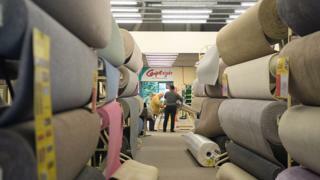 Carpetright chief executive Wilf Walsh said: "The first half has undoubtedly been challenging. Consumer confidence remains fragile and we continue to manage the impact of intensified competition." Despite the fall in half-year profits, like-for-like sales - which strip out the impact of store openings and closures - rose 0.7% in the UK and 6.5% in the rest of Europe. Mr Walsh added: "We have made pleasing progress in our core flooring business in the UK - like-for-like sales are up, more than half the UK store estate has now been refurbished and our customer service metrics have been improved significantly. "However, as previously flagged, our first half profits reflect the impact of the clearance of discontinued lines in our beds business and also unsuccessful deeper discounting promotions in the Netherlands and Belgium, which are now being addressed." Matt Walton, senior retail analyst at GlobalData, said the increase in like-for-like sales showed the retailer was "gaining traction with shoppers", but it faced challenges in the short-term. "The next six months will provide a true litmus test of how well Carpetright's strategy in the UK is working. "Weak consumer confidence for big-ticket items and continued store closures as the retailer works towards its target of 400, means Carpetright will continue to struggle with revenue growth in the UK. "Once conditions improve, Carpetright will be well placed to drive sales and profit gains," he added.